Spring has finally arrived and summer is close by and this means fresh produce galore! 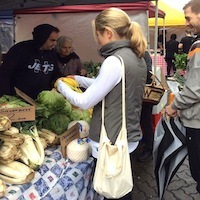 Below is the list of the top free entrance organic produce markets around Sydney. Details: The iconic El Alamein Fountain being its backdrop, Kings Cross Markets offers organic and conventional fruit and vegetables, homebaked goods, savoury goods, fresh flowers and plants. You can grab a coffee and bite to eat here too. Details: Offers organic fruit and vegetables, artisan breads, some of the best coffee to be found, yummy egg and bacon rolls to enjoy while you browse. It is undercover. Details: This one is for the whole family, while you shop the kids are kept entertained with a jumping castle. Organic and conventional fruit and vegetables, artisan including gluten free breads, gourmet produce, grass fed beef, free range eggs and organic skin care are at the markets. Details: An expansive range of organic fruit and vegetables, seasonal produce such as garlic and feijoa, free range eggs, grass fed beef, gourmet delights, eco friendly mind body and spirit products, gluten free goodies, plants, medicinal herbs and the list goes on. Details: Certified and conventional fruit and vegetables, chutneys, nuts, grass fed beef, plants, eco products, fair trade and more. Details: Organic and conventional fruit and vegetables, seriously scrummy condiments (meet the chef! ), grab some Gozleme for lunch or pulled pork rolls, jumping castles, pony rides and baby animal farm to keep the kiddies entertained while you pick up fresh produce. Details: Organic fruit and vegetables, milk, cheeses, wines, breads, pastries, cakes and other sweet goodies, smoked fish, Thai food, crepes, coffee and pies. Details: Organic fruit and vegetables, organically grown meat & poultry, just picked flowers, artisan breads, homemade jams, farmstead cheeses, seafood, olive oils, herbs, spices and much more. Great review. Have been to some of these markets, and you have now promoted my resolution to visit the others. Also, EQ Markets, which although not totally organic has a couple of organic Fruit and Veg stalls that are there every Saturday and Wednesday. 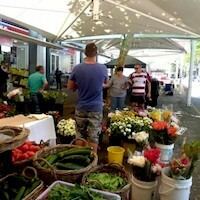 And, north Sydney farmers market which is the third Saturday of every month. Again not totally organic, but there are number of organic providores and growers.